Indonesia is a “Megabiodiversity” country which has the second largest terrestrial biodiversity in the world after Brazil and the world’s No. 1 richest country of marine biodiversity. Of the 40,000 species of flora that exist in the world as many as 30,000 species found in Indonesia and 940 species of which are known to be efficacious as drugs that have been used in traditional medicine for generations by various ethnic groups in Indonesia. Of these, 74% are still taken directly from nature and 26% (7,000 species) have been cultivated, but only around 940 species have been used and only 465 species have been screened in the national drug industry list. 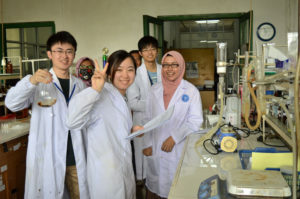 The purpose of this Summer Course is to provide information about the use of Indonesian biodiversity for herbal medicine in terms of the broad aspects of Chemistry. Submission of this information will be carried out in class, practicum and fieldtrip to the garden of medicinal plants and major herbal medicine companies in Indonesia. 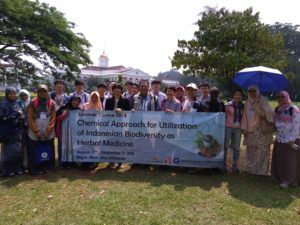 This information starts from a comprehensive understanding of Indonesian herbal medicine/herbs, cultivation of medicinal plants, extraction and standardization, efficacy studies in vitro and in vivo, formulation and towards commercialization. Understand the use of Indonesian biodiversity as herbal medicine/jamu. Know about herbal medicine as a part of natural culture and health. Explain the cultivation of medicinal plants based on active ingredients. Know the standardization of raw materials and extracts using chemical analysis methods. Learn about the efficacy test for medicinal plants used as herbal medicines in vitro. Learn about the efficacy test for the formula extracts of medicinal plants used as herbal medicines in vitro. Understand the mechanism of extract formula as an herbal medicine. Explain the making of herbal medicine scientifically. Explain about the industrialization of herbal medicine.